Brandy, Rum or Whiskey: Which Makes the Best Eggnog? Which Liquor Makes the Best Eggnog? Will it be brandy, rum or whiskey in your eggnog this year? All are common liquors for eggnog, but which is the best? I put this question to the test, making a glass of eggnog using each of the three and tasting them side by side. Our conclusion is that, while each has their own profile and are nice in their own right, brandy is the best. That's our personal taste and brandy is probably the most traditional eggnog base - rum is right up there and there are a few centuries to back me up. For the brandy eggnog, we used Korbel VS and it was a perfectly balanced drink. This eggnog had a nice sweetness in every sip, which paired admirably with the creamy egg base. It has a catchy, lively flavor with more depth than the others and a nice, warm brandy note that doesn't hide behind the eggnog, nor was it overly pronounced. This eggnog is almost floral and a real delight to drink. You might even say that it can turn any anti-eggnog person around. Mount Gay Eclipse was the rum of choice for the rum eggnog and it was right behind brandy in our personal preference. Yet, in a side-by-side comparison to the brandy, the rum fell a little too much into the background. It was almost to the point of being unnoticeable. While the rum was very subtle, it was a bit more pronounced on the back end. Overall, the eggnog was tasty and just sweet enough so you could taste that there was something beyond the creamy egg mixture. Originally, the whiskey eggnog was not what I was hoping for. For this taste test, we had used the Jim Beam Black Label, which was the only non-scotch whiskey in the bar's stock at the moment. It was certainly an interesting eggnog and the flavor was captivating at first, then the novelty wore off. Unwilling to let whiskey off the hook because there is potential here, we later did another eggnog taste test. In this round, we pitted the original brandy and rum choices against both the sweeter bourbon of Maker's Mark and the spicy rye whiskey that is High West Double Rye. Whiskey, no matter which style, does make the most flavorful eggnog as the profile just pops out of the drink. The Maker's Mark profile led to an eggnog that is more in line with the brandy, it simply added that whiskey kick to the eggnog. It is quite tasty and I wouldn't hesitate to make this again. The rye whiskey turned out to be equally impressive but in a different way. Here, those spicy rye notes sprang out of the eggnog and tantalized the tongue. It was fantastic and a very interesting taste experience, though it's not a two-round drink. One was enough for the evening. Which Liquor Will You Choose for Your Eggnog? As mentioned, this is a matter of personal taste, as is eggnog in general. Which spirit you prefer may not fall in line with mine. Hopefully, however, this gives you a good starting point on where to go with your own eggnog adventures. Do a taste test for yourself: choose two or three spirits and a simple eggnog recipe. Be sure to include brandy in your tasting. It's like the control liquor of the group and you'll be surprised at how well it works. Stay away from white and spiced rums. Choose a gold or aged rum instead as the other two styles are either too light or too spicy for a good eggnog. Try at least two styles of whiskey. Remember that whiskeys vary greatly from one style to the next, and even within each style (particularly with bourbon). Your experience may mimic my own where you're disappointed in one whiskey but fascinated by another. Don't rule out a tequila, either. Seriously, as we have seen in the Texas farm nog, this really can work. While that recipe has a bit of sherry for back up, give tequila a chance in a standard eggnog recipe. The earthiness of this spirit works surprisingly well, though you will want to choose either an añejo or reposado tequila. Most eggnog recipes can work with any of the three common spirits. 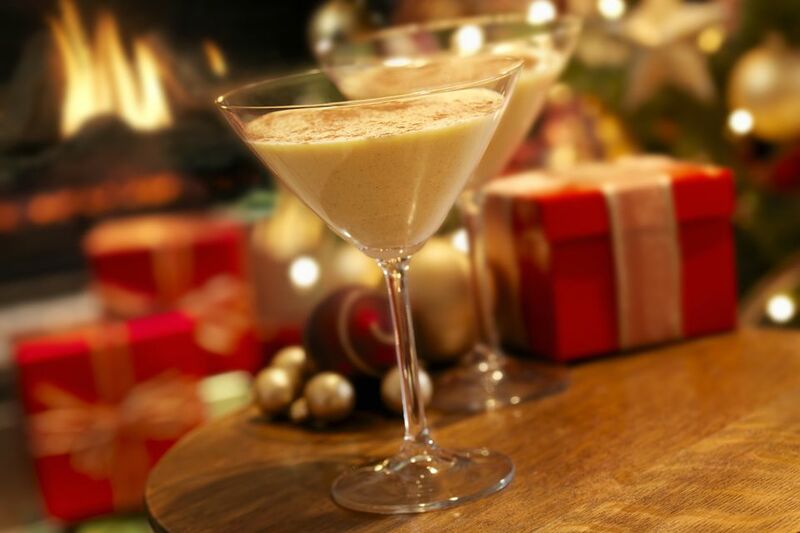 Once you discover your personal preference, try it in a new eggnog recipe alongside the liquor the recipe recommends. Most importantly, have fun with your eggnog taste test. It's not a bad experiment to take part in, so grab a few nog-loving friends and shake them up!